This Praline Crunch should come with a warning label! It is HIGHLY addictive!! We could not stop eating this. We both had zero self-control around this yummy Praline Crunch. Sweet and salty goodness in every bite! This recipe makes a ton, so there is plenty for sharing (if you make yourself share). This can be made ahead of time and stored in an air-tight container. I am making a batch to take home for Thanksgiving. It is perfect for snacking and watching football games! It would also be great as a homemade holiday gift. 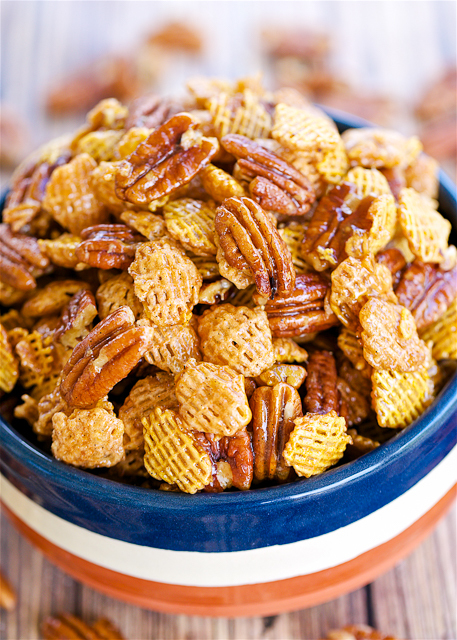 In a large bowl, combine cereal and pecans. In a medium saucepan over medium high heat, combine brown sugar, corn syrup and butter. Bring to a boil, stirring occasionally. Remove from heat and stir in vanilla and baking soda. Pour over cereal mixture, tossing to coat evenly. Pour cereal mixture into a 9x13-inch pan. Bake for 1 hour, stirring every 20 minutes. Pour onto wax or parchment paper to cool. Break into pieces. Oh my goodness you'd have to hide this from me or I'd eat it all in one sitting! ADDICTIVE!! The other commenters are right! Either hide or you will eat the whole batch yourself--guaranteed!!! I made this for the holidays and it was a hit. how can something so easy to make taste so good. I love anything “sweet and salty” but I don’t see any salt listed in the ingredients. Is it missing? 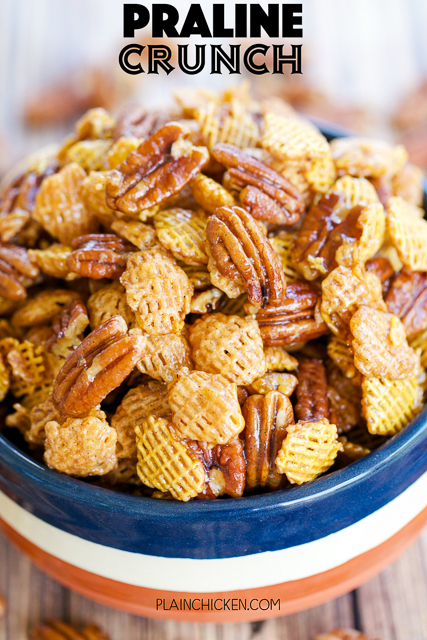 Or do you use salted pecans? Hi! I was wondering that, too. But I noticed it doesn’t state unsalted butter. So I’m guessing the salt will come from the butter if you use salted. Just a thought! I enjoy your recipes so much!!! So does my family. My Mom used to make Cracklin' bread in pones in an iron skillet. I wonder if you might check with your parents, grandparents about this recipe and pass it along. Thank you so very much for considering it!! Do you use salted or unsalted pecans and what about the butter? Did anyone get a reply? You can use either on both. It is your personal preference. Can this be made ahead and then freeze? Thank you! Do you use light corn syrup or dark? Thanks. Can maple syrup be used instead of the corn syrup?? I’ve never tried this with maple syrup, so I can’t say with certainty how it will turn out.